Posted on Fri, May 6, 2011 : 8 a.m.
A crowd listens during Sonic Lunch last year. 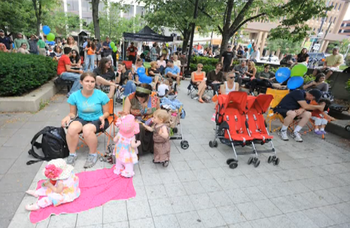 Sonic Lunch, the free outdoor concert series that's been a popular summer attraction in downtown Ann Arbor in recent years, has announced its lineup for the season. Once again, concerts will take place on Thursdays from noon-1:30 p.m. in Liberty Plaza, at the corner of Liberty and Division streets. Sponsored by the Bank of Ann Arbor, the series starts June 2 and runs through Aug. 25, with a break for the Ann Arbor Art Fairs. Bands playing at Bank of Ann Arbor’s Sonic Lunch include local and regional favorites along with several nationally touring acts. The full schedule follows, with descriptions from Bank of Ann Arbor. Weekly restaurant partners are returning again with box lunches on site. New this year, beverage partners will be on site offering coffee and smoothies. Visit www.soniclunch.com for the latest Sonic Lunch news and announcements. Follow Sonic Lunch on Facebook at www.facebook.com/soniclunch and Twitter at www.twitter.com/soniclunch. Bank of Ann Arbor serves up Sonic Lunch with support from Ann Arbor’s 107one and Perich + Partners. Fri, May 6, 2011 : 4:55 p.m. The music is always too loud. I don't like the crowds. I like eating my Le Dog soup there in the relative peace and quiet. I enjoy being grumpy on Thursdays. Fri, May 6, 2011 : 2:17 p.m. Awesome! Great local talent and I ADORE Serena Ryder! Looking forward to sunny, fun Thursdays this summer! Fri, May 6, 2011 : 1:25 p.m.
Fri, May 6, 2011 : 1:05 p.m.
&quot;Sonic Lunch&quot; is a festive and fun free concert series. This year will be no exception. The lineup looks great. The food offerings are also a treat. Good music . . . good food . . . happy families with little kids dancing and flying around. Now, all we need is some weather cooperation. Kudos to Bank of Ann Arbor, 107.1, and Perich + Partners!